We’ve previously written about the joys of friendships in the office. But how many employees consider their coworkers real friends? According to a recent survey by Olivet Nazarene University, while 82% of respondents work with someone they consider a friend, they only see 15% of their coworkers as ‘real friends’. A majority (41%) of coworkers were categorised as just that – coworkers. Another one fifth (20%) were considered ‘only-at-work-friends’, while 22% were considered strangers, and 2% were considered enemies. Among the 3,000 Americans with full-time jobs surveyed, the average number of friends reported was five, with just 29% saying at least one of their coworkers is a bestie. 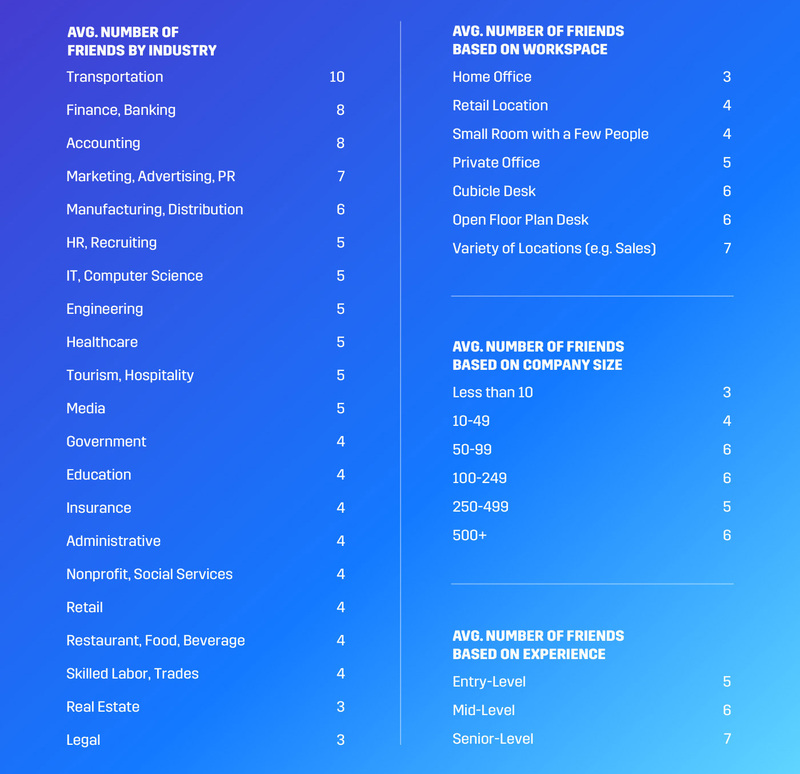 By industry, those with the highest average number of friends were from transportation (10), finance and banking (8), accounting (8), and marketing/advertising/PR (7). 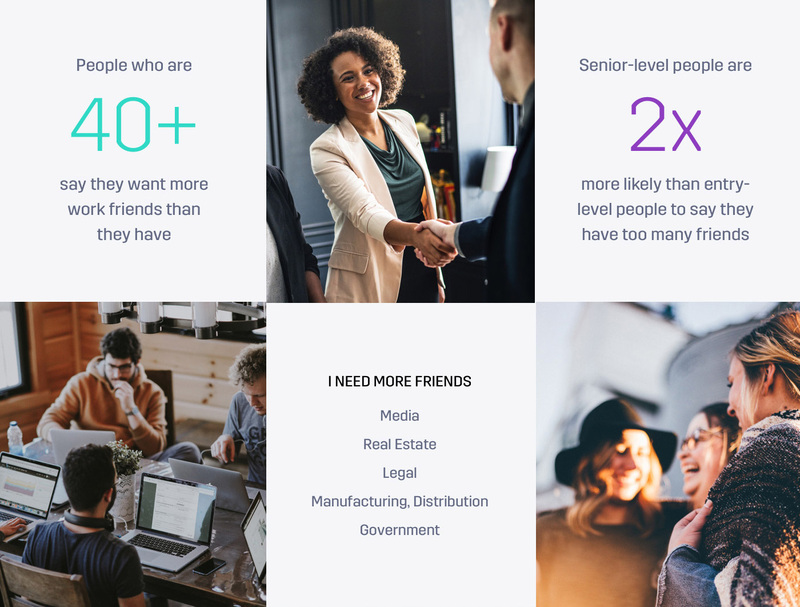 Whereas industries with the fewest friends include legal and real estate, each tallying three friends per respondent, on average. Based on workspace, those who work in a variety of locations (e.g. outbound salespeople) have the highest number of friends on average (7), followed by those who work in open floor plan desks (6), and cubicle desks (6). Perhaps unsurprisingly, those working in home offices have the least number of friends – just three. Overall, employees were satisfied with the number of work friends they have (76%). Of those remaining, 20% said they’d like more friends and 4% said they have too many. Respondents in industries that are more social in nature were more likely to say they have too many friends, such as workers in restaurant, food and beverage. 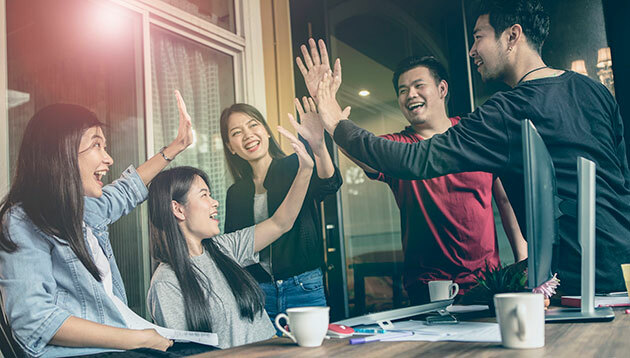 According to respondents, work friendships tend to form quickly, with 58% saying they typically become friends with a coworker within a couple of days or weeks. Industries that make friends quickest include insurance, marketing, restaurant, retail and real estate. Those in engineering, healthcare, finance, HR and government tend to take longer to bond. Once coworkers become friends, as in any solid friendship, sensitive subjects are inevitably discussed. Almost three in five (58%) have a work friend they can talk to about their love life, 53% can talk about health issues, 33% can talk about financial issues, and 64% can talk about conflict with other coworkers. That said, many don’t indulge too much – one in three don’t talk to coworkers about things unrelated to work for more than a few minutes per day. 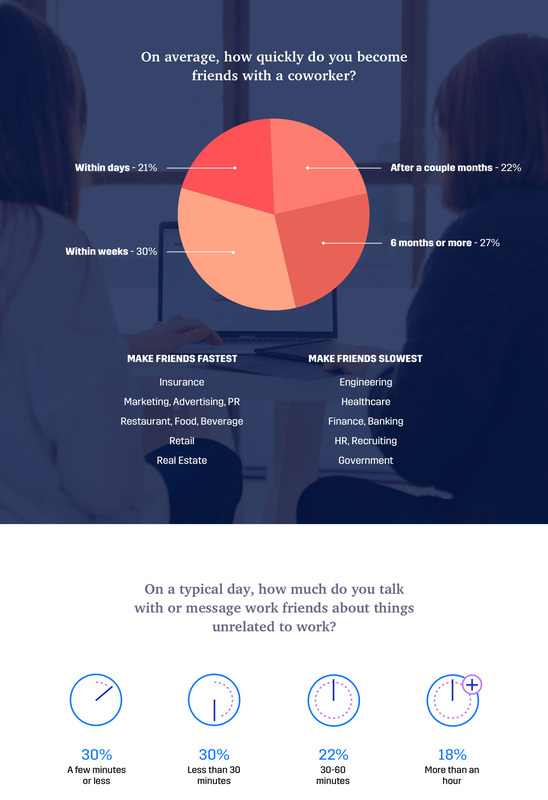 68% talk to work friends about how much they make. The industries most likely to do so were: marketing, advertising, PR; retail; engineering; restaurant, food, beverage; and tourism, hospitality. While those least likely to do so were from media; non-profit, social services; administrative; insurance; and legal. 62% hang out with work friends outside of work – 20% do so weekly, while the majority (41%) only do so a couple times per month. 53% have introduced work friends to their non-work friends and 69% have introduced work friends to their significant other. Sadly, these friendships are unlikely to last for long. Only 18% of respondents reported staying closely in touch with a work friend they no longer work with. Slightly more than half (55%) stayed in touch a little, while 27% barely stay in touch.